I never liked the Prince Valiant comic strip growing up. I would skim over it, not being all that interested in the Arthurian tale. It just didn't seem entertaining. And yet it's endured for over 75 years. So clearly, there must be something wrong with me. Dynamite's 'King' series, featuring classic comics retold with today's best writers and artists, has been a thoroughly entertaining event. 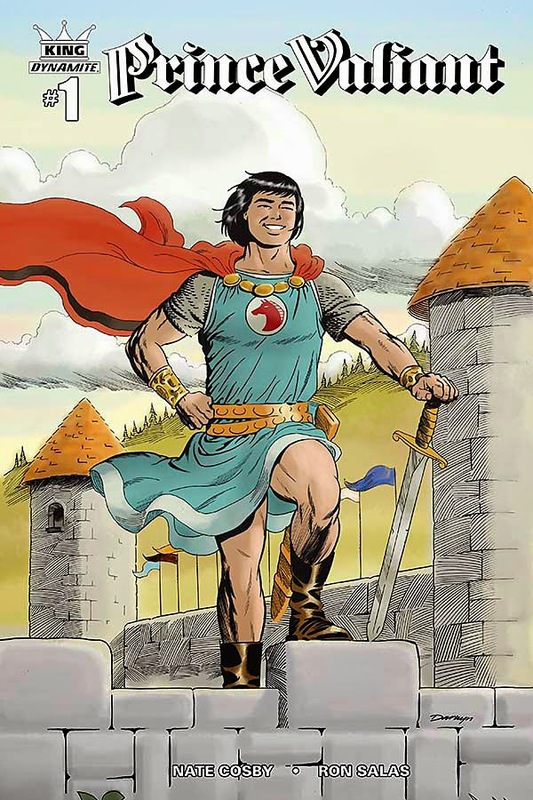 Prince Valiant from Nate Cosby and Ron Salas is another home run. The book opens up with unknown narrators, one requesting a tale. And so it begins with a young, cocky, talented swordsman who's a bit of a hot-head. It's the perfect start designed by Cosby to introduce Valiant as a bit of an immature punk who's going to have to do some growing up before he can serve with honor. Although, he's not too much of a jerk to turn off the reader completely. It'll be interesting to see how Valiant relates to the larger crossover plot of the 'King' series in fighting Ming, who has taken over the earth, considering his time is way in the past. Salas does a great job of creating a grand landscape in the countryside where King Arthur's kingdom resides. The action scene is handled deftly and the facial expressions are dead on. Along with Luigi Anderson's colors the world, for the most part, is bright and inviting. This is not a dense read, it actually breezes by but it's a great introductory issue for new readers as well as a nice homage to longtime fans. It's certainly worth picking up and staying on for the first arc. The story execution is clear and involving, the art is flawless and the cliffhanger will have you coming back.